One of the reasons I was most exciting to finally move into the new house (have I gone on enough about it yet?) was being able to cook. While staying in a beautiful house with friends for the last two months has been great, having half a salad crisper worth of space in the fridge (yes, really) was bordering on torture. Now, in the new house, I'm only sharing with A and S and we have no plans to be militant about fridge space. I ordered my huge food shop (so many things to buy when you start from scratch!) on Wednesday so have been getting into the habit of cooking things - and then having to eat them off one of two chopping boards as we don't have any plates or bowls yet. 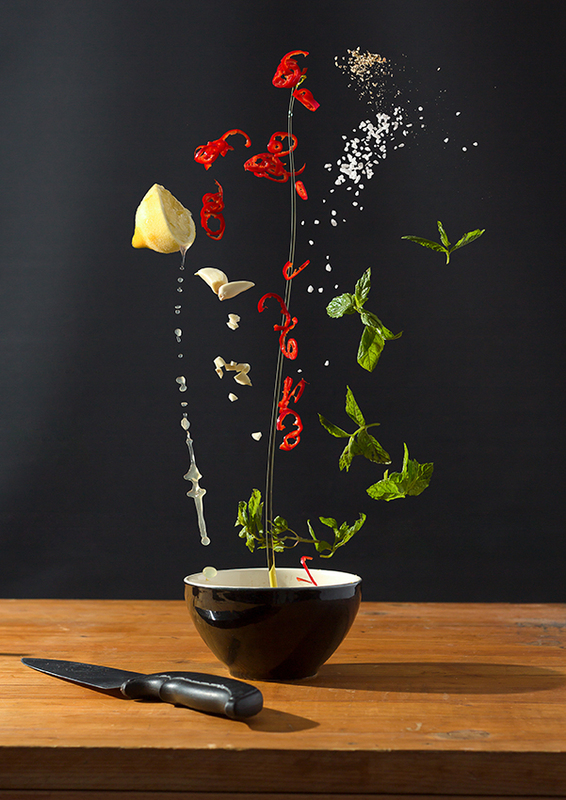 I stumbled across this incredible food photography; ingredients given life by being tossed into the air and captured just at the right moment (I think the one above looks a little like a flower, don't you?). How the dish looks when cooked is up to you - pristine cuisine, eat your heart out.